Played sometimes with beautiful artistic pieces on fantastic boards. Sometimes played with stones and bottle caps on a board scratched in the dirt. Having been invited by Sunil Weearmantry, and his son, GM Hikaru Nakamura; John Brezina was off to Sunrise, Florida this month. Where he attended the local Mayor's Chess Challenge. 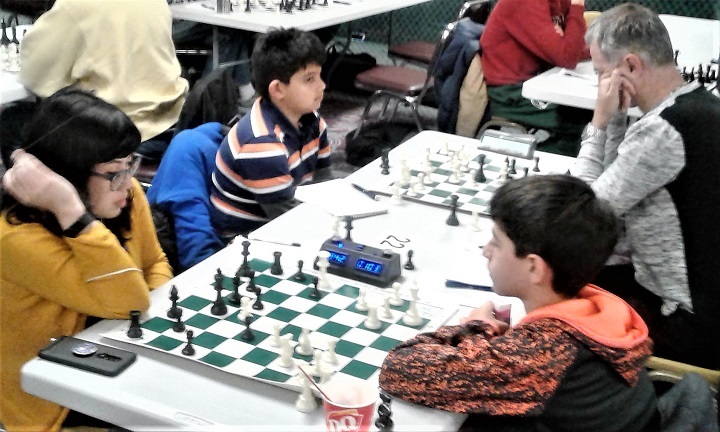 Quoting Mr. Brezina, "Sunil and Robert McLellan, both with the National Scholastic Chess Foundation, have put together a great community chess outreach program down there. I had a great time helping teach a little and playing some blitz with some of their stronger kids." Interest in chess is definitely on the rise. Check out the Sunrise Chess Center here: https://www.sunrisechesscenter.org/index.php And, of course, Mr. Brezina - "amateur photographer extraordinaire"- took some great pictures while he was there. 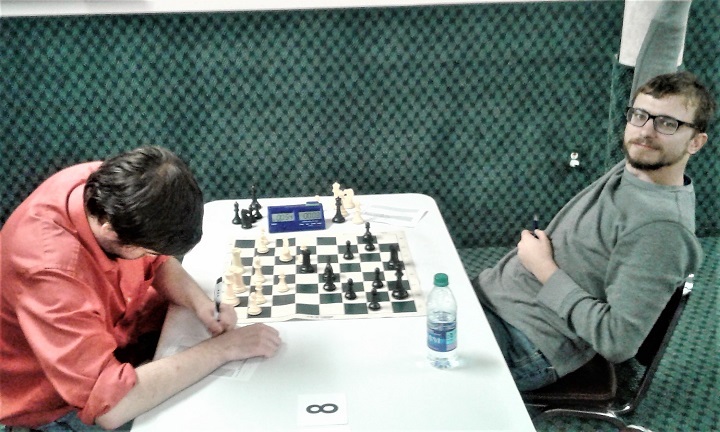 The growth of scholastic chess all across the United States is good sign that interest in chess is also growing. It is heartening to me that parents of chess playing children recognize the benefits of playing this ancient game. Played sometimes with beautiful artistic pieces on fantastic boards. Sometimes played with stones and bottle caps on a board scratched in the dirt. With either, chess captures the imagination of children and adults alike. "When you play Bobby, it is not a question if you win or lose. It is a question if you survive." - Boris Spassky. "Many chess players were surprised when after the game, Fischer quietly explained: 'I had already analyzed this possibility' in a position which I thought was not possible to foresee from the opening" - Mikhail Tal. "I see my own style as being a symbiosis of the styles of Alekhine, Tal, and Fischer." - Garry Kasparov. 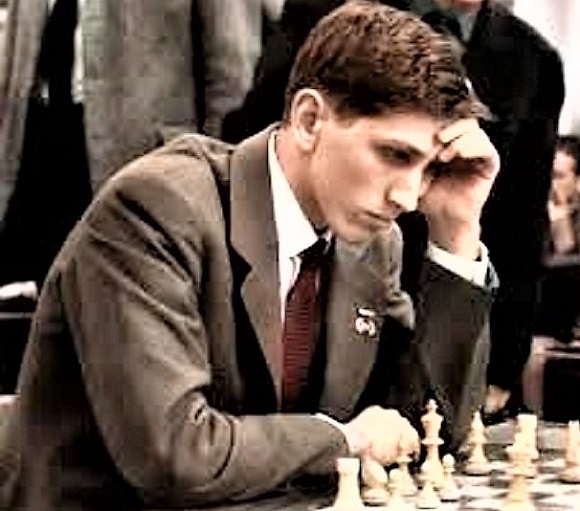 Bobby Fischer, as we all would like to remember him. NM Richard Shtivelband at the board on his way to winning against NM Brian Wall in round 2. 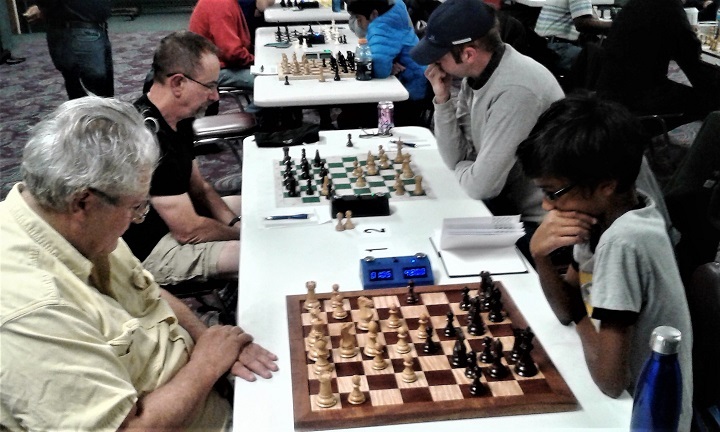 Mark Krowczyk with the White pieces against Vedanth Sampath. 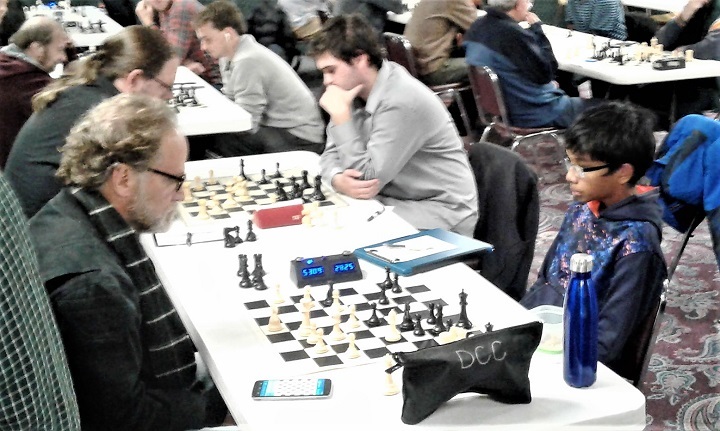 In the foreground, NM Brian Wall is playing White against Vedanth Sampath. Joel Senger has Black against Kevin Seidler. I am glad to see Joel Senger rising off his rating floor. Getting his game back here at the Denver Chess Club. Mr. Senger took clear 3rd place with a nice last round upset win over Kevin Seidler to finish with 3.5 points and win 40 dollars. Vedanth easily won the 20 dollar Upset prize. Even with draws only counting for half the rating difference, his combined upset total was an astounding 610 points. Ben Gurka recording his move against Alexs Bashtavenko. Who do you suppose won the U1900 section? You may be thinking, surely Ben Gurka could not have finished in clear 1st place again. Wrong. At least he was held to a draw in the last round by, new to the DCC, Alexs Bashtavenko. Mr. Gurka said he was forced to make a perpetual to avoid losing. So that's encouraging; that he can sometimes get into a difficult position. Ben won 94 dollars with his 4.5 point score taking clear 1st place. 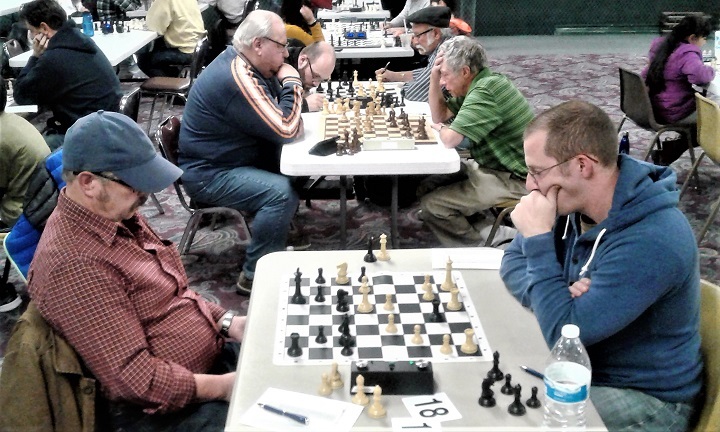 In the U1500 section, I was glad to see a long time DCC player, George Peschke, share the combined 1st and 2nd place prize of 150 dollars with Robert Corboy. Mr. Peschke lost his round 1 game against Mark Fischer then won 4 straight. Mr. Corboy finished in clear 1st place last month and had 4 points after 4 rounds this month, but did not play the last round. We would like all the players to play all the rounds, but of course that is not always possible when the games are once a week. Work, family, and life sometimes gets in the way of our chess playing. George Peschke in the blue hat is playing Tyler Bowling. 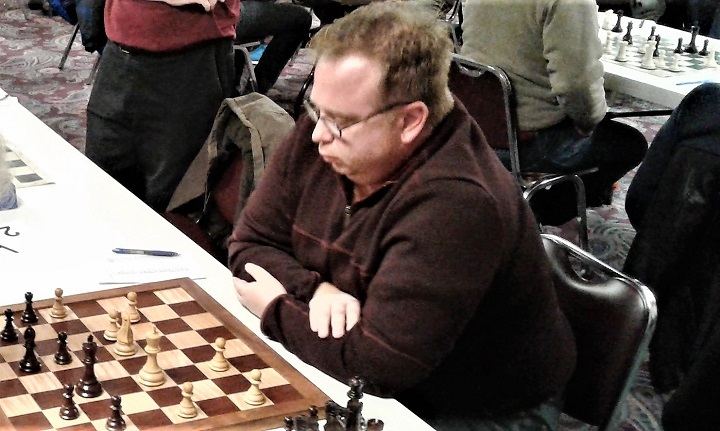 In the background, Mark Fischer has the White pieces against Paul Kullback. Alayne Wilinsky is playing Black against David Pupko in the foreground. Abhinav Krishna has white against Vyacheslav Pupko on the other board. Congratulations to all the prize winners and thanks to all the players who win, lose, and draw at the DCC on Tuesday nights. Here are a few diagrams and game links from this month's tournament:. 4) Richard Shtivelband vs. Kevin Seidler. Round 4. Black has just played 27... Bd8-b6 probably expecting a trade of Bishops. What did Mr. Seidler overlook? 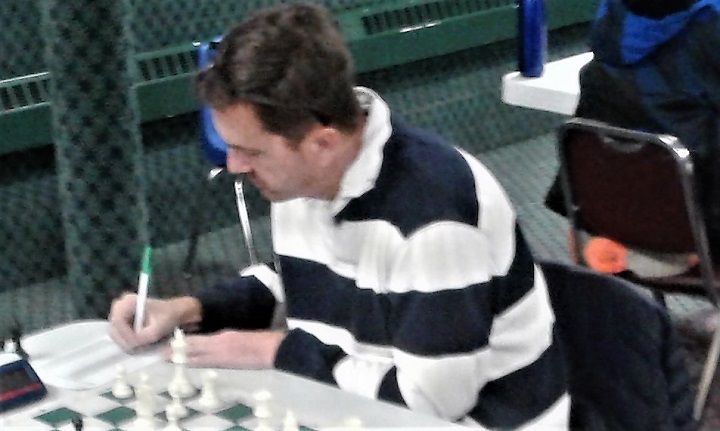 https://denverchess.com/games/view/17939 Observing Mr. Shtivelband's excellent technique over the remainder of the game is educational. Saying "just a matter of technique" is easy, but not so easy to actually do.